➤ F-A-B! Thunderbirds stamps are go! 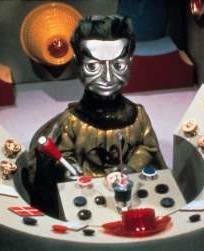 ❚ TODAY THE ROYAL MAIL (AND THE TIMES’S FRONT PAGE) honour 50 years of Supermarionation by 1960s puppetmaster Gerry Anderson with a set of “lenticular” postage stamps that appear to move — no strings attached. When tilted, the stamps create the illusion of movement to show the launch of the four main Thunderbirds vehicles, along with Captain Scarlet, Stingray and other Anderson shows. 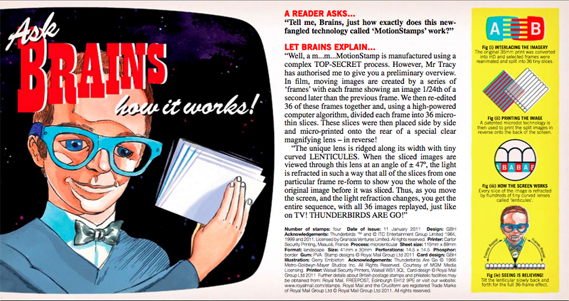 Each frame has been drawn by Gerry Embleton, illustrator of 1960s comic TV Century 21, and these are Royal Mail’s first motion stamps to be printed with microlenticular technology. 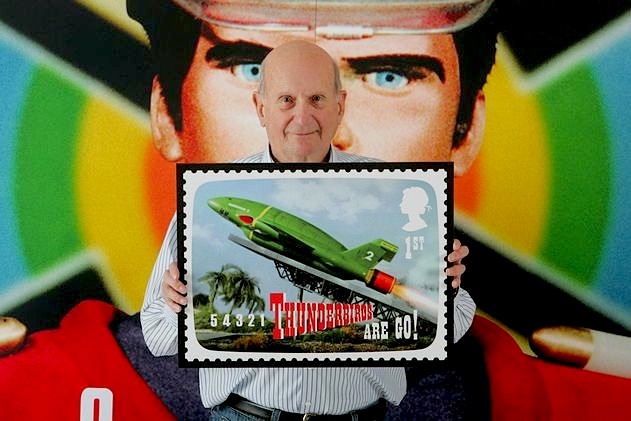 F-A-B: The Genius of Gerry Anderson is the full title of the stamp issue and Gerry Anderson MBE, 81, who lives in Henley, says he feels “incredibly proud”. The stamps feature characters who first arrived on TV screens in the 1960s, beginning with Mike Mercury and Professor Beaker in Supercar, 1961. The scifi space adventure Fireball XL5, piloted by Colonel Steve Zodiac and Robert the robot, followed in 1962 and Stingray in 1964. The idea for the Thunderbirds international rescue organisation was inspired by a real-life mining disaster and Lew Grade’s ATV backed the first series in 1964 which made stars out of Lady Penelope, her pink Roller and her chauffeur Parker. Captain Scarlet and the Mysterons followed in 1967, and Joe 90 in 1968. All enjoyed revival as TV cults during the 80s and in the 90s the children’s show Blue Peter was showing audiences how to build their own Tracy Island. Anderson also wrote and delivered a treatment for a James Bond movie, elements of which eventually informed The Spy Who Loved Me, 1997.